Pressure transducer level ranges of 0-3', 0-15', 0-30', 0-60', 0-120', 0-250', and 0-500' are available. The 0-3' low-level range is ideal for measuring shallow flows or small water level changes like those encountered in sewers, storm drains, weirs, and flumes. The 0-3' water monitoring sensor accurately measures small changes in water, even when the water's depth is only a few inches deep. Other metal foil-type water level sensors typically have serious problems at low-level ranges because of sensor crinkling, stretching, and drifting. The submersible pressure sensor may be placed slightly below the lowest expected water level. 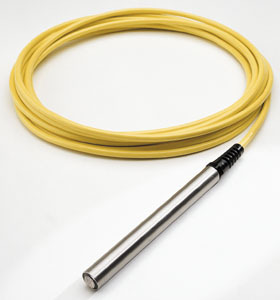 Water level sensor level ranges of 0-3', 0-15', 0-30', 0-60', 0-120', 0-250' and 0-500' are available. When ordering, select the level sensor range that will cover the maximum water level change (this is not necessarily the total depth of water). Selecting the smallest water level range possible will ensure the greatest accuracy. The 4-20 mA signal can run up to 3,000' from the water level sensor to the logging device. Common twisted pair or electrical extension cord wire may be spliced to the vented cable once the cable is out of the water. The 4-20 mA signal may be converted to 0.5 to 2.5 VDC by dropping the current signal across a 125 ohm resistor. The WL400 Water Level Sensor can be used to measure water level, well depth, groundwater level, surface water flow, pipe flow, and water pressure, etc... NOTE: Polyurethane cable is not recomended for use with hydrocarbons or high concentrations of chlorine. Please look at the our WL450 Water Level Transmitter to meet the requirements of these types of applications. When ordering, specify water level range that will cover the maximum water level change for your application (this is not necessarily the total depth of water): 0-3', 0-15', 0-30', 0-60', 0-120', 0-250', and 0-500'. NOTE: There is a $50 extra charge for 0-500' range sensor. Selecting the smallest water level range possible will ensure the greatest accuracy. Includes 25 feet of cable. Cable length is measured from top of logger to bottom of sensor. WL400 includes 25 feet of cable, and extra cable can be added up to 500 feet. Water level sensor is housed in a 8" PVC (PRPP) or stainless steel pipe with 3/4" NPT male thread (PRPM) for logging pressure in municipal water systems. 10' cable standard. Calibrated in psi with ranges of 0 to 30 psi, 60 psi, 100 psi available. Mouse-shaped cover protects sensor from fouling and velocity effects in sewer, stormwater and irrigation pipe flows. Mouse is attached to 4" X 24" stainless steel strap for mounting sensor on pipe bottom.